Should PC makers be leaving media centres alone? 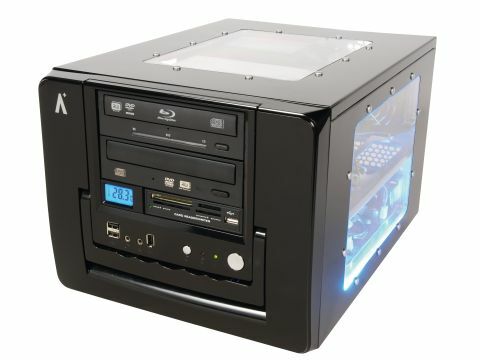 Cyberpower is a well-established manufacturer of gaming PCs, and its Media Centre HD represents the company's push into the high-definition arena. Question is, should Cyberpower have stayed in its comfort zone? Opinions were divided when we unpacked the system. Some thought that the unusually shaped case was on the right side of stylish. Others saw it as a throwback to boxy Amstrad hi-fi units and top-loading VHS players. Given the PC's pretty average specs and its lack of monitor, keyboard and mouse, you have to wonder why anyone would want to shell out almost £850 for it. The answer lies in the LiteOn LH-2B1S optical drive, which would cost around £400 to buy separately. That's the price you'll have to pay to play and burn Blu-ray discs. If you're not interested in this next-gen functionality, walk away now. Those of you who want a PC with the power of Blu-ray to be the cornerstone of your lounge, and are happy with the Cyberpower's looks, will no doubt want the system to be seen and not heard. Guess again. Even if you use the controller to drop the fan speed to its lowest setting, the system still sounds like it's home to a family of mosquitoes. Such noise levels are fine for a workaday PC, but unacceptable for a media centre system. It's not as if this is a high-powered PC that needs noisy cooling solutions, either. Yes, it's a dual-core system, but only of the second-string AMD variety, and there's not even the heat of a standalone graphics card to remove. At least the motherboard is a good choice for a media-centric PC: it's passively cooled and features a HDMI port for hooking up to a high-def TV. Strip out the Blu-Ray drive and drop the price accordingly, and you've got the ideal enthuasist's backroom PC that ripe for upgrading. As it stands, Cyberpower's system needs a bit of a rethink.